HISTORY has officially renewed Academy Award winner Robert Zemeckis’s hit historical drama series Project Blue Book for a 10-episode second season. The series had its debut earlier this year on January 8 with an average of 3.4 million viewers per episode. Project Blue Book is based on the real-life, top-secret investigations of the United States Air Force regarding Unidentified Flying Objects (UFOs) and other phenomena during the 1950s and 1960s. Project Blue Book is inspired by the personal experiences of astrophysicist and ufologist Dr. J. Allen Hynek, a brilliant college professor, is recruited by the U.S. Air Force to spearhead a clandestine operation called Project Blue Book. Along with his partner, the debonair Air Force Captain Michael Quinn (Michael Malarkey), he is summoned to investigate UFO sightings around the country and use science to discover what really happened. However, when some encounters cannot be explained away and cases remain open, Hynek begins to suspect that he has been duped by the government into a larger conspiracy to cover up the truth. Set against the backdrop of the Cold War and rising Atomic Era, each episode will draw from the actual Project Blue Book case files, blending UFO theories with authentic historical events from one of the most mysterious eras in United States history. The series stars Game of Thrones alum Aidan Gillen, Michael Malarkey (The Vampire Diaries), Laura Mennell (Van Helsing), Michael Harney (Orange is the New Black), Ksenia Solo (Lost Girl), Neal McDonough (Suits), and Robert John Burke. The show is created by David O’Leary who also serves as co-writer with the series’ showrunner Sean Jablonski. It is executive produced by Robert Zemeckis (Forrest Gump) Jacke Rapke, and Jack Levine of Compari Entertainment along with O’Leary, Jablonski, Barry Jossen and HISTORY’s Arturo Interian. 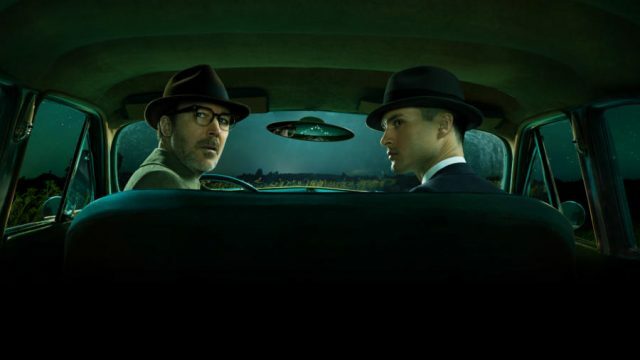 The post Project Blue Book Renewed for Season Two appeared first on ComingSoon.net.